This was published in a newspaper regarding a presentation that my grandpa delivered at the Mira Costa (CA) High School on Career Day. My grandpa was working in the Communications Equipment Design Section at TRW Systems at this time. The above newspaper quote does not appear to be of major importance until you look at the date: April 1, 1966. I was intrigued that he was talking about the chronological history of computers and the differences between analog and digital computers. It has only been in the last couple of years that we the public have heard the term digital in electronics, but this was 1966 and not 2001. I am speechless. This is a short personal heritage search essay on my grandpa. This is not a biography on his fascinating life, which would be a countless number of pages. I will discuss through my research some of the interesting facts that I have found along with my personal memories. I will also discuss some of the experiences and memories of other family member's. 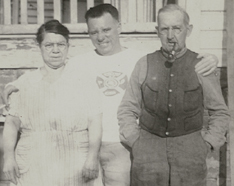 My grandpa was born in Uniontown, Pennsylvania on November 20, 1910. He was forced to quite high school at a young age because of the depression. He needed to work to help his family survive. My grandpa chose to go to work in the coal mines to support his family. My grandmother and grandpa were married in 1936 and lived in Washington D.C. He completed the entrance exam and passed, where he began his school career at the George Washington University, he was 26 years old. He attended classes at different Universities until he was 58 years old. "Al McCabe began his career as a Communications Officer in 1939. 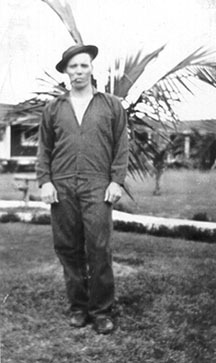 He worked for the War Department Message Center, Army Radio Station in Washington D.C." (Dataoptions.com/almccabe.htm. 23 November 2001). He had an impressive career as a communications engineer for several companies and had a Secret-Security Clearance with the government. "Mr. McCabe has presented many papers on such diverse topics as guidance systems, radiation and trajectory analyses, theoretical aspects of dielectrics at elevated temperatures, and theoretical aspects of passive reflector devices." (Resume. 3 March 1983). He has applied for a total of 8 patents. The most impressive one was the "Automatic Missile Error Scoring System", which is now known as the Global Positioning System (GPS). Some of the programs that he worked on were the development of early warning search radar's at the Navel Research Laboratory, design, engineering, and production of test equipment for the H bomb test, active jamming systems for the B52 aircraft, FAA systems, the Voyager (Mars) program, (Apollo) lunar test, (Apollo) re-entry test package, classified Satellite Relay Systems for the Armed Services, and the Mars Soil Water Analyzer for the Viking program. "As Astronauts, we fully appreciate your pledge of continued dedication and support in your work with the Apollo Spacecraft Program." (NASA letter, 17 March 1965). This was a letter of appreciation that he received from the National Aeronautics and Space Administration (NASA), Manned Spacecraft Center, Houston, Texas. It is signed by all of the Astronauts involved in the program. My grandpa Albert Philip McCabe, also known as "MAC" to many, was full of life. My grandpa who is my mother's father has truly impacted my life. I feel very fortunate to have shared 24-years of my life with him. I have an enormous wealth of cherished memories with him during those precious years. My grandpa lived in many places in the United States, but always came back to reside in Redondo Beach, California. 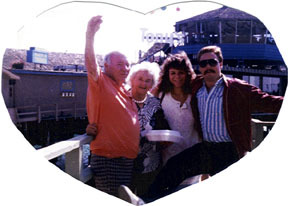 He lived at five different places in Redondo Beach during different years of his life. This is where I have the most memories of him. He had a passion for the beach. He could be seen jogging on the beach and swimming in the ocean almost daily. I can still remember our visits to Redondo Beach. The front door would open and there would be grandma with a big squeeze and kiss. I can still smell the freshly baked cookies that grandma would always bake for us. Behind grandma would be grandpa big as ever and full of life. He would grab me and give me a big bear hug every time. We would always end up on the ground wrestling, which would proceed with him tickling me until I had a tear. The only way that I could stop my grandpa was by saying the word "UNCLE," he was my hero. My mom said that grandpa always made time for his grandchildren, he would always pay attention to what we said. My grandma and grandpa always lived in a large apartment complex and always had a big pool that we could swim in. His passion for the ocean became my passion too. I can remember when I was around ten years old he asked me if I would like to learn how to free dive, of course being an adventurous young boy I said, "yes." We piled into his little VW bug and drove to the local scuba diving store. He bought a pair of fins, dive mask, and snorkel for me. I can remember smelling the new black rubber on them. We drove back to the apartment and spent the remainder of the day in the pool. He taught me how to dive down, come back up to the surface, blow, then breath through the snorkel. I had such a great time. We also did this on many trips back and eventually in the ocean at Redondo Beach. I remember collecting many seashells on my dives. A few years later I became a certified scuba diver. I have logged over 500 underwater dives to date in many countries. I still remember my grandpa when I go scuba diving. I can remember when we went to my grandparents on a Fourth of July one year, of course we swam in the pool and celebrated with the family. When night fell we all went down to the rear alley to light fireworks. My grandpa had bought some fireworks for us to enjoy. We played with sparklers it was fun. My grandpa nailed a spinning type of firework onto the telephone pole that ended up being quite a show for us. He lighted the firework, which began to spin with large colorful flames, but what my grandpa didn't expect was that the telephone pole caught on fire. I can remember the excited people when the pole caught on fire. I was to young to understand the problems that could develop from this, I just remember there being quite a fireworks show for us kids. The adults were able to extinguish the flames and things settled down. Almost on all of our trips to see grandpa we would go to the Redondo Beach Pier. I can still smell and taste the cotton candy that we always received. We would always go to the end of the pier and see what the fishermen were catching. We would play some of the games on the pier. We would always end up eating at a restaurant on the pier. I can always remember my grandpa and parents would carry these glasses that they purchased at "Tony's at the Pier." I can remember everyone talking about how Tony's making the best drinks or maybe because they were able to keep the glasses, anyhow I was to young to appreciate it at that time, I do know that we always had "Tony's by the Pier" glasses in the kitchen cabinets. Another memory is when my grandpa took me deep sea fishing on a boat off the pier. I am fortunate to have a photograph of this trip. I had a lot of fun, not sure about grandpa because he had to keep taking fish off my line. I think he spent most of his time attending to me. Of course grandpa was happy to always help. These were special times for grandpa and I.
I feel very fortunate that my memories with my grandpa were up until a few weeks before he died. He died on my mother's birthday June 27, 1987 when he was 77 years old. My wife who was my fiancée at the time, my mother, and I went to visit my grandparents in Redondo Beach just a few weeks before he died. This trip would be different than others. I would have my last bear hug. My grandpa looked tired and was not his out-going self today. I could tell that my grandmother was deeply concerned with grandpa's health. He had been through a few heart attacks and open-heart surgeries. As I sat there and talked with my grandpa this was a different type of conversation than in the past. I can remember him telling me that his mind was still twenty-years old, but his body was failing. This was very hard for me to hear from my grandpa. I could see the disappointment in him regarding is physical body. Grandpa wanted so much to be running on the beach and swimming in the ocean now he could only remember such events. As we continued to talk, he wanted to give me items of his to take home. He loved gaining knowledge from books. I did not want anything from grandpa, but he insisted over and over again. He gave me some of his books that I currently keep on the shelf with my books. He gave me his military dog tags that I keep in the top drawer of my desk, which I handle from time to time. My wife and I would talk about this trip together to my grandparents. My wife never had a grandpa and considered him to be her grandpa. We talked together and felt that he had given up because of his health. After looking back on this trip I realized that he was trying to form closure with his family. My wife and I were married two months later and so wished that he had attended. He was deeply missed. My grandpa refused us to have a memorial service for him, still showing his deep concern for his failing physical body. He wanted all of us to remember him the way he was in life, full of life. His ashes were spread over the Pacific Ocean off Redondo Beach, California where his passion was. I have made a few scuba dives off Redondo Beach since then and would like to think that he was diving with me in his twenty-year old body. My grandpa has been a tremendous influence in my life and still is, but not only in my life but my families' life too. He has two great grandsons Wesley and Brandon that would have idolized him like I did. You can see the McCabe resemblance in them. I can see grandpa wrestling with the both of them. I have often wrestled with both of my boys, and then tickled then until I heard the word "UNCLE," I would tell them that my grandpa used to wrestle and tickle me also when I was your age. His passion for the ocean and education has been passed onto my sons Wesley and Brandon. I will be receiving my Bachelor of Science diploma in June 2002, which I will dedicate to my grandpa. I will be starting my master's degree program next year, and I like my grandpa will consider school as a lifetime event. My grandpa was my hero. He is extremely missed by his family and I. There is a hole in our life that nothing can fill. I look forward to your bear hug embrace, grandpa. God Bless you. McCabe, Linda, daughter. Personal Interview. November 22, 2001. Unknown Author. "A.P. McCabe Speaks at High School Career Day." Unknown Newspaper Article. 1 April 1966. Apollo Spacecraft Astronauts letter. National Aeronautics and Space Administration. 17 March 1965. Albert P. McCabe. "Resume." 3 March 1983. 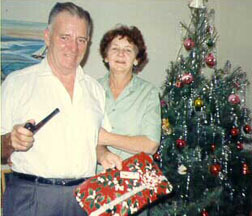 McCabe, Aimee L. Walker, daughter. Albert P. McCabe. November 23, 2001. Copyright © 2001 Erin S. Cleary. Republished with permission.